This past week we celebrated our 35th wedding anniversary. Over the weekend we went up over the mountain to the little town of Chemainus, home to painted murals depicting the town's history, charming homes and wonderful gardens. We had fun wandering throughout the town, snapping photos, talking, and admiring. Sometimes just an overnight getaway can provide that bit of distance from real life and enable relaxing disengagement. Chemainus is also home to the Chemainus Theatre. We've attended a number of productions and save one, have thoroughly enjoyed them. Joseph and the Amazing Technicolor Dream Coat made me smile widely throughout. Such energy! A big bouquet of roses to the staff at the hotel. We arrived, as planned, on Friday evening. We had booked the night, dinner and the theatre. Unfortunately, I had reserved for Saturday evening, not Friday. The staff immediately called the theatre and the dining room and arranged for us to eat and watch the musical in spite of my mistake. We had excellent seats and a wonderful dinner. My blog fix up (previous post) is coming along well, but it's so time consuming to take down photos from the blog, delete them separately in Picasa, resize them, then repost. A lot of posts lack photos, but I'm making progress. What a lovely anniversary trip! I'm so glad everything worked out and you got to do the things you wanted to do! Enjoy your week! Happy, happy anniversary. The town that hosted you on your getaway looks charming! Happy Anniversary! I'm so glad that you enjoyed your getaway in that charming community and saw the show. (I've never seen it and would really like to.) Ohhhh, roses for the hotel...you're so thoughtful...a sweet thing for you to do even though they were very kind in getting things straightened around. A very happy anniversary to you!! Isn't that great when people go over and above their jobs to help. So glad it worked out well for you and you had a great time! Chemainus is the perfect place for a little getaway - just far enough to feel away, and not so far that you're exhausted from the drive. Happy Anniversary! I've never been to Chemainus but it looks totally delightful. Glad you had a sweet anniversary trip. A restful weekend it sounds like, to celebrate so many blessed years together. I noticed your comment on my blog links me to you in a new way, but does not link me back to your blog yet. Maybe you're still working on that. It sounds like a big challenge, what you're dealing with on your blog. But it all looks great! I was just notified that my Google storage ran out again too! Best way is to buy the extra storage without the headache of trying to mess with Picasa - that's how I lost my entire original blog Across The Pond a couple of years back! You may still end up with big empty squares in your old posts if you remove photos from Picasa! Google storage prices have now been made monthly rather than annual - I bought 100GB for $4.99 a month which, although higher than what I was paying annually, is still not that bad if one takes as many photos as I do! Blogger seems to be a free way to blog - compared to others such as Typepad - but eventually one has to pay up for the photo storage. The upside to all this - meeting lovely friends around the globe via ones blog, hooray!!! Congrats. on your anniversary Lorrie - glad you celebrated in such a delightful town. But then are there any towns on the island that aren't beautiful? Doubt it! Love your area so much - hope to get back there next year for sure. Happy Anniversary to you! We are off on a little anniversary get-away tomorrow. Your mini-vacation in Chemainus sounds perfect...including the tickets to one of my favorite theatre productions. We did the narrated tour the last time we visited Chemainus...and I so enjoyed the history lesson. Happy anniversary to you! That would have been an enjoyable musical to attend! Congratulations on your 35th anniversary. We will celebrate our 35th in August. I hope I never have to go through what sounds like an exhausting process with the photos -- so far, I've just bought the extra storage from Google at $5 per year, but I wonder if I'll be able to keep doing that. I suspect I'd end up deleting many posts instead -- but even so, then I guess I'd have to go to Picasa to delete the accompanying photos -- aaargh! Happy Anniversary to you both, your trip sounds lke a wonderful way to celebrate the occasion. Glad that the staff was so helpful, Lorrie. 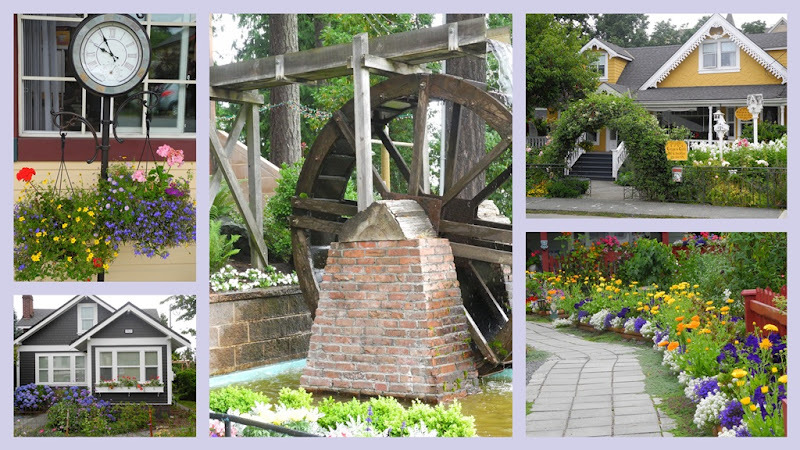 What a perfect place to visit on your anniversary, i love wandering along the streets of Chemainus. Here's to another wonderful year od marriage! I clicked too quickly... Here's to another year of married bliss - the best to both of you!